If you were lucky enough to grow up in the 80’s, you probably remember a series of family vacation movies. There was European Vacation, Summer Vacation and my personal favorite, Christmas Vacation. Chevy Chase was the lead character and played the persistently-optimistic-in-the-face-of-disaster Clark Griswold. The movies started with visions of his idyllic vacation, and as the movie progressed, everything fell apart. It’s funny how we seem to have ideas of how perfect the next family vacation will be, yet frequently those ideas don’t quite play out. Things go wrong, people get frustrated, feelings get hurt, and suddenly it’s not the relaxing, enjoyable vacation that had been imagined. Yet it seems those unforeseen events are exactly what builds character, not just for the individual, but for the entire family. There are many successful people who have commented on the role adversity plays in their life. 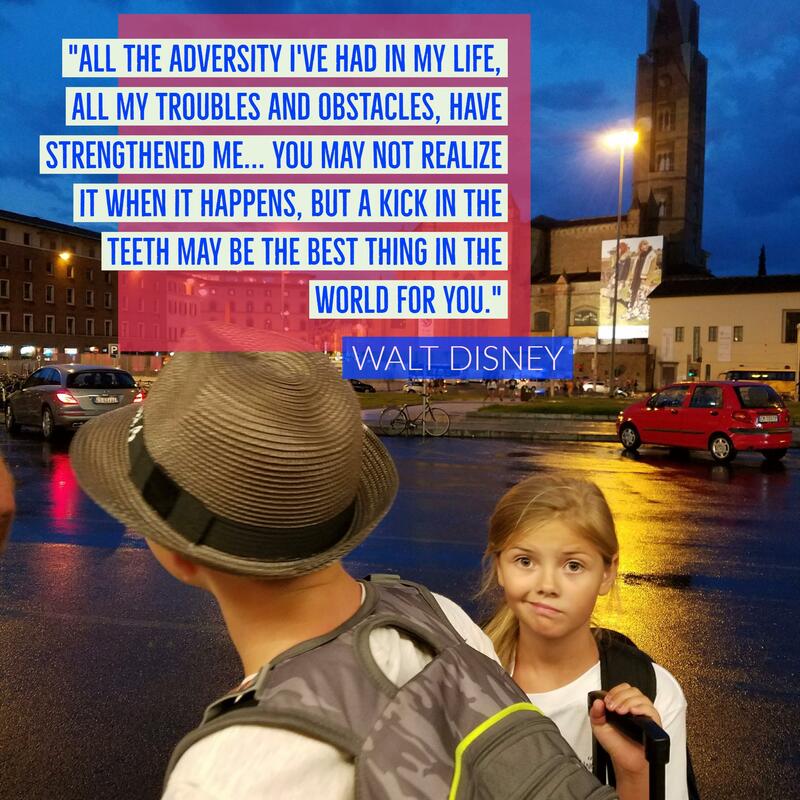 I like this particular quote from Walt Disney, especially considering all the adversity he went through before finally creating the Disney empire. As I write this, I sit in a comfortable first class seat on a train headed for Rome. Right now everyone is happy, and all is going well. But 7 days ago, we had one of those unplanned deviations from the idyllic. Here’s what happened and how we handled it. We were in Ericeira, Portugal, which is northwest of Lisbon and planned to go to Sintra to visit the beautiful Pena Castle, which was about 45-60 minutes by car or bus. Our wonderful AirBnB host was headed in that direction that morning, and offered to give us a ride. We were happy to accept the ride, and as he drove us there, he told us of the history of the castle, the people who had lived there, its uses through time and also told us about the history of the area. It was a great ride, just the sort of thing we had envisioned as we traveled through Europe. The castle is situated on the top of a steep, fairly tall mountain, so the last part of the drive was going up a steep, very narrow road with multiple switchbacks. At one point Little Sister, who was sitting in the middle of the back seat, announced she felt sick. Car sick. About 2 seconds later, it started. Violent vomiting. Some would call it projectile vomit. Because of where she sat, and the lack of warning, it got everywhere. The center console and gear shifter took the most damage, but nothing - and no one - was spared. All five of us were hit. The back seat. The front seats. The floor. The ceiling. Behind her (how did that happen?!?). Indeed, it was a scene straight from one of those Chevy Chase movies. To make matters worse, because the road was so narrow and busy, we couldn’t stop. Miguel, our gracious host, driver and now victim, could only continue driving until we got to a place with enough room to pull over. His right shoulder and arm (as well as the inside of his car) were covered in Little Sister's breakfast. Fortunately, the windshield had escaped unscathed, so he was still able to see to drive. He mentioned he had a box of Kleenex in the glove box, so Hilarie and I used those to start cleaning as best we could. Little Sister was apologizing profusely. She felt so bad about the situation. Big Brother cleaned himself as much as possible and provided color commentary on the grossness of the situation (because you know, we wouldn’t have known if it were gross or not…). Miguel drove and laughed. Yes it was gross, unplanned and far from ideal (he was headed to a wedding later that day, and now his car smelled like throw up), but it’s all part of life. We got to a place where we could pull over, which was also our final destination, and Miguel was able to get some baby wipes from the trunk (Pro tip: Kleenex is not a viable vomit solution. Baby wipes are much better. Actually, baby wipes are great for cleaning up just about any mess). We cleaned up the car and ourselves pretty well (the car didn’t even smell), and thanked him again. He refused to take any money to pay for cleaning the car. It belonged to his employer, and he said they would pay for the cleaning. When traveling with children, keep a bag handy for motion sickness. The Boy Scout motto has great application here. Even if you don’t have a baby anymore, baby wipes are good to have on hand. I had forgotten how versatile they are. Miguel had them on hand because his oldest just turned one. More important is this: In life, you never know when - metaphorically speaking - someone’s kid is going to come along and throw up on you and your car. You can’t control that, but you can control your reaction. Miguel handled this situation with humor and calm. A good mix, and a good way to approach many of those unexpected events that happen in life. If you travel - especially with your family - being able to roll with whatever punches come is a requirement. While it was gross and a little tense when it happened, it’s now something we can all laugh about. 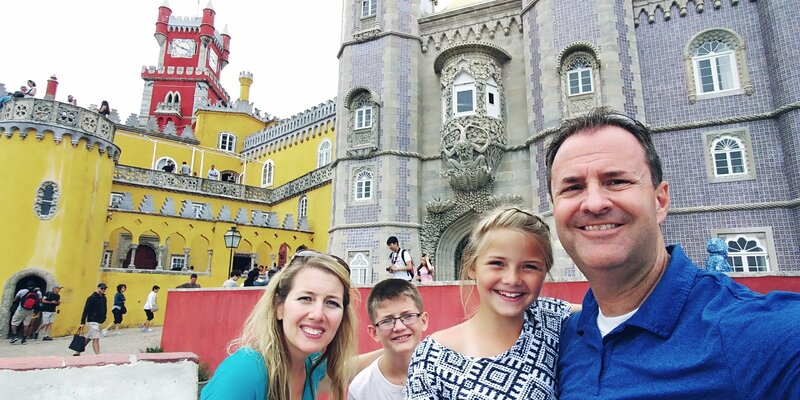 Learning how to laugh at life's little surprises is a great tool, and I think that spending time with family - especially traveling - is a great way to develop that skill. How have you learned to “roll with the punches” that life throws at you?